Time for a Castle Birthday! 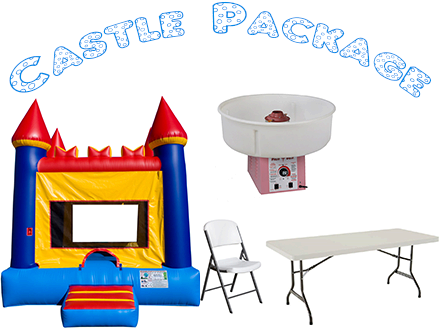 This adorable Castle birthday party package gives you everything you need to throw an awesome birthday party for a special boy or girl. You'll get the awesome Castle Bounce House that is greeting your guests at the entrance, two tables and 10 chairs. Then you can top it off with one of our Cotton Candy machines that will have your kids lining up for seconds!